Sublime space of comfort and refinement, Chalet Blanchot is located in the famous Hameau de Bellecôte, a private estate combining serenity with its proximity to all the pleasures of Courchevel 1850. With a wealth of materials and textures, harmony of colours and fabrics, magnificent decoration and furniture, sophistication and high-tech equipment... Chalet Blanchot is certainly one of the most beautiful chalets in Courchevel amongst those available for rental in the Courchevel 1850 resort. 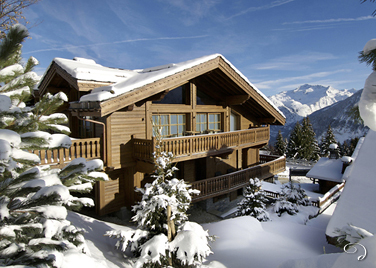 The chalet has 6 beautiful bedrooms with en-suite bath/shower rooms and can comfortably accommodate up to 12 people. Its habitable surface area is approximately 565m² (6080 sq.feet), over 5 floors with a lift. Swimming pool 9m x 4m with relaxation area, jacuzzi and steam room, massage room. Fully equipped Gym, superb home cinema, ski room and garage. Three double bedrooms with en-suite bathrooms. Two reception rooms with open fireplace, dining room and fully equipped Gaggenau kitchen. Greeting on arrival at chalet, Manager assigned to the chalet, daily 8 hour cleaning service carried out by two people, house linen provided (sheets, towels, etc. ), bedding and towels changed twice per week, upkeep of the chalet and swimming pool, Internet connection, tourist visitor tax, water consumption and electricity are also included. Clean linen each day, chef, helicopter trips, chauffeur, taxi and car hire, ski instructor, etc.